Note: The following is a from the Greek text, offered for the many who love the Saint and who benefit from his speedy help. Also note that the meter of this translation is not set to match the original music. In Evia you lived practically, and were adorned with the pure roses of virtues, giving fragrance to your fellow refugees in these latter days, O Father, you who equalled the feats of the sacred David [of Evia] and the most sympathetic deliverer of those who suffer, therefore we cry out: Rejoice, O blessed Iakovos. Rejoice, O lamp of spotlessness. Rejoice, offspring of Livisiou of Makri. Rejoice, abyss of humility and canon of mindfulness. Rejoice, you who watered them with mystical rain. Rejoice harbor of love of the age to come. Rejoice, standard of prayer and fasting. You followed the steps of the former desert ascetics in these days, O Father, and showed forth the Monastery of St. David to be a strong valve of the steadfast, O Iakovos, who ceaselessly cry out to God at your struggles, Alleluia. Rejoice, lighthouse of those storm-tossed. Rejoice, you who trampled upon the enemy who hates good. Rejoice, most radiant star of divine sympathy. Rejoice, for you cast out every tribulation for those close to you. Rejoice, corruption, casting away the demon. Rejoice, standard of the modest life. 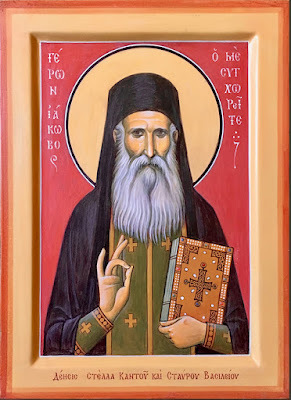 Having received divine power, you escaped the traps of childhood, and kept the robe of your soul chaste and white, ever casting out evil words far from you, O venerable Iakovos, and we cry out with fervor: Alleluia. Rejoice, the nectar of gladness. Rejoice spiritual pillar of beauty. Rejoice, star shining with the rays of grace to the faithful people. Rejoice, for you pour forth gifts of healing. Rejoice, fierce striker of the demons. Rejoice, through whom every mortal is strengthened. 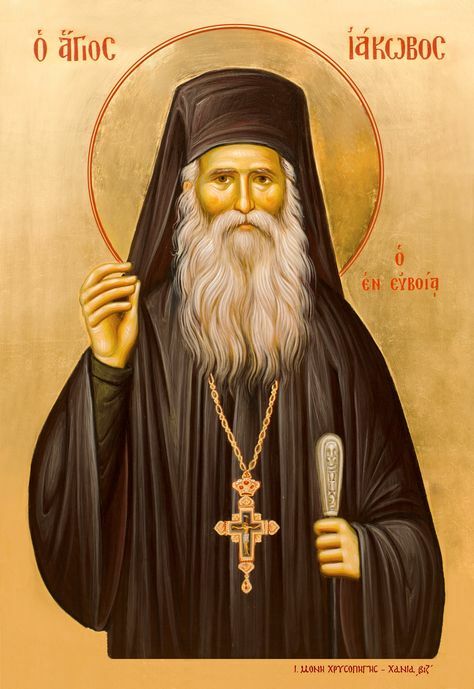 Having a burning faith, you gave yourself to a multitude of struggles, and softened your flesh as wax, O ascetic, that your nous might be winged towards our Lord and God, O all wondrous Iakovos, to Whom you chanted in a spotless tongue: Alleluia. Rejoice, the boast of divine fasting. Rejoice, you who trampled upon the roaring of the enemy. Rejoice, heavenly man, guide on the monastic way. Rejoice for you rightly were granted the crown of glory. Rejoice, newly-radiant lamp of purity. Rejoice, imitator of God-bearing men. Wishing to imitate the ways of the divine David, you approached him man-to-man every evening, O wise one, and throughout the whole night, O Father Iakovos, you chanted to the Creator, and mystically chanted, crying out: Alleluia. Rejoice, equal in deeds to the Venerable. Rejoice, treasury of the divine life. Rejoice, for you watered them with your pious teachings. Rejoice, the radiant guide towards poverty. Rejoice, the God-loving practitioner of righteousness. Rejoice, unconquerable flailing of the demons. Rejoice, the radiant vessel of grace. You became an inhabitant of perfect love towards your neighbor, ceaselessly praying on behalf of those near you, and for those who are terribly suffering, O Father. 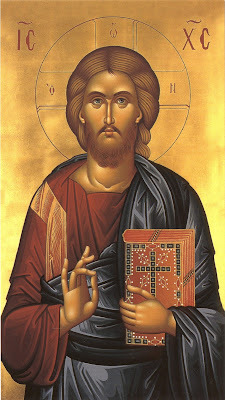 Speedily hasten to the aid of those who approach you in faith, and cry out loudly: Alleluia. Rejoice, the support of the storm-tossed. Rejoice, most-bright lamp of fasting. Rejoice, for you saddened the enemy who hates the good. Rejoice, the one in extreme piety. Rejoice, present boast of my heart. Rejoice, river of many kinds of wonders. 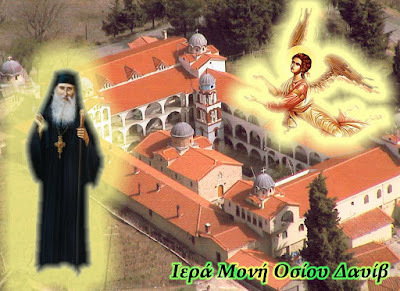 The island of Evia magnifies your painful struggles with much endurance, O Iakovos, and everyone perceives you to be the protector of those who are sick, and takes boast in you, O Elder and leader of the Monastery of St. David, and in response to your sacred intercessions, cries out: Alleluia. Rejoice, the foundation of chastity. Rejoice, the beloved of Christ the Master. Rejoice, for you desired the wondrous things of heaven. Rejoice, unassailable pillar making firm the storm-tossed. Rejoice, you who ever behold His radiance. Truly a strange hearing! How you trampled upon scorpions, O wise one, and through your prayer were unmoved by the assalts of the enemy, O Elder and Father, and remained glorifying the King of all with spotless lips, chanting: Alleluia. Rejoice, trumpet of modesty to all. Rejoice, the great teacher of the spiritual life. Rejoice, very precious boast of monastics in asceticism. Rejoice, for you trampled upon the conceit of the enemy. Rejoice, icon of love and watchfulness. Rejoice, radiant lamp of virginity. You were shown to be a newly-founded tower of chastity and perfect love, O Iakovos, and therefore we have come to know you to be a divine and joyous myrrh-container of discernment, O precious one, and we cry out to you mystical hymns: Alleluia. Rejoice, lyre of the faith. Rejoice, lamp of eternal resolve. Rejoice, golden cloud richly granting healings. Rejoice, shelter from the delusion of the crooked-mouthed enemy. Rejoice, you who turn away shameful delusion. Rejoice, planter of God-pleasing plants. 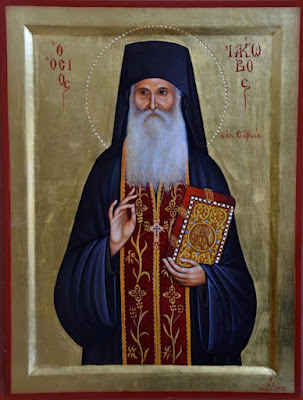 The ranks of the Orthodox gathered from all ends of creation to bury your joyous and wondrous body, and the people seeing you blessed you, O venerable and blessed Iakovos, and were moved to faith, crying out: Alleluia. Rejoice, attacker of the error of the enemy. Rejoice, newly-built foundation of watchfulness. Rejoice, pillar of purity and the monastic way. Rejoice, for you beautified the choirs of your monastery. Rejoice, our defender in dangers. Rejoice, the consolation of all the faithful. 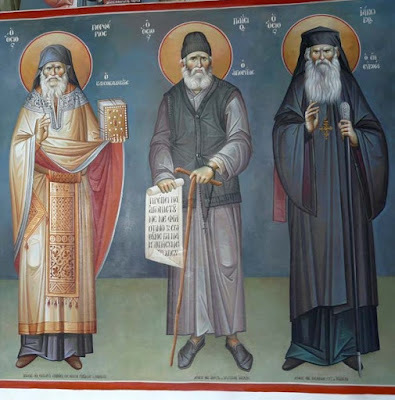 You did not give rest to your eyelids, or repose to your divine head, O Father, until your spirit proceeded to the hand of God, O new beloved one among ascetics, and you gave up your spirit, joining the chorus that sweetly hymns the Creator: Alleluia. Rejoice, the protection of mankind. Rejoice, imprint of the wisdom of God. Rejoice, holy communicant with the heavenly armies. Rejoice, blessed man and director towards God. Rejoice, comely mouth that drives away evil. Rejoice, adornment of the faithful people. Rejoice, fire that quenches delusion. You impart grace to all from the uncreated Trinity, for you were made worthy to see things aforetime, and to guide the faithful towards eternal life, and perfect joy, O Iakovos, therefore we piously hymn you, crying out: Alleluia. Rejoice, guide towards the perfect life. Rejoice, sword that cuts apart the roaring of the evil enemy. Rejoice, for you now dwell with them in the heavenly mansions. Rejoice, new enemy of satan. Rejoice, sweetness in the soul of your entreater. O fervent defender of those who hasten to you, and river of many kinds of wonders (3), with the clouds of your intercessions, rain upon us peace, and grant us your blessing, O Iakovos, that we might chant unto you: Alleluia. Apolytikion of St. Iakovos Tsalikis in the Plagal of the First Tone. 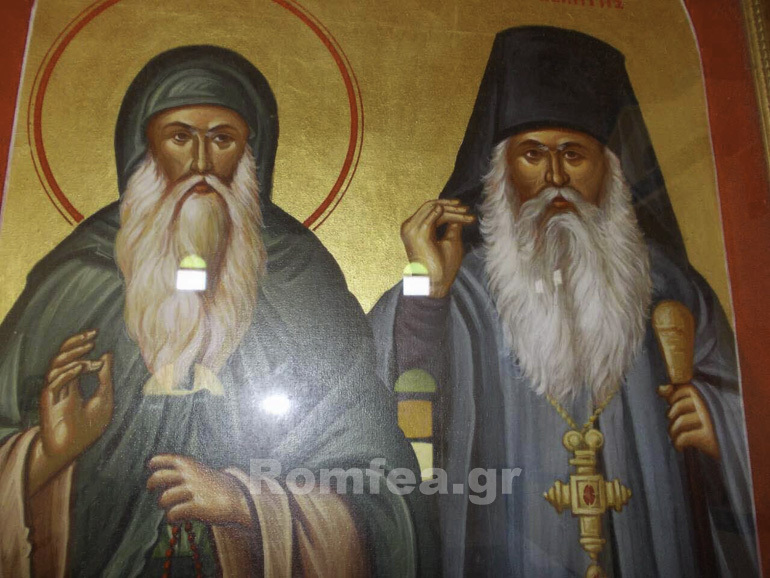 Video on the Life and Miracles of St. Iakovos Tsalikis: "A Saint of our Days"
Today, Monday November 27th, together with breaking news of Romfea.gr, Elder Iakovos Tsalikis was canonized by the Holy and Sacred Synod of the Ecumenical Patriarchate, under the leadership of Patriarch Bartholomew. 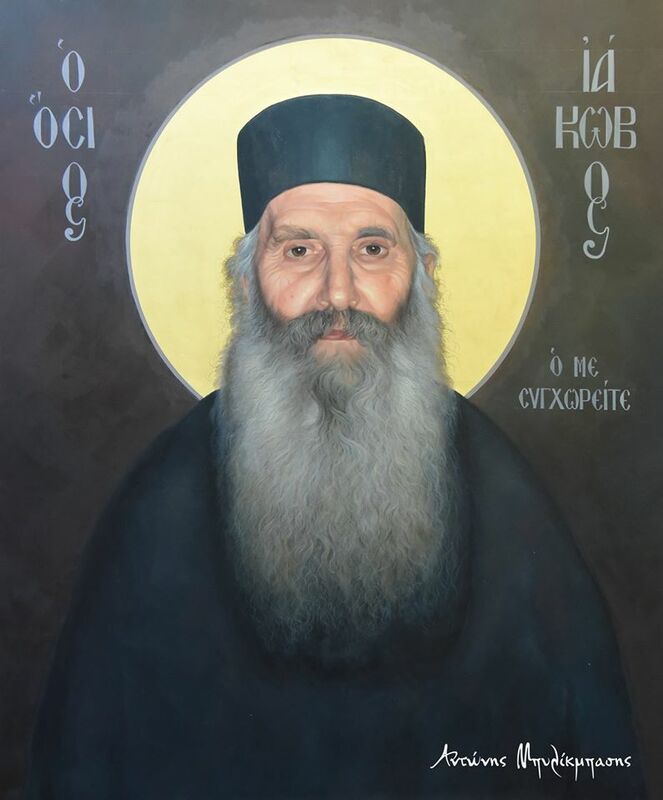 It should be noted that the memory of St. Iakovos Tsalikis will be celebrated on November 22nd. 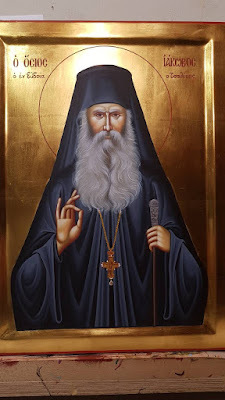 Elder Joseph of Vatopedi: "Now we are on our way to venerate the Nativity of our Christ..."
"Now we are on our way to venerate the Nativity of our Christ. What shall we tell Him? What will show our worth to Him? Now is truly the hour to gather a little care, a little painful work, a little self-denial, a little humility, a little self-reproach, so that we might say with fervor before the Infant: 'O All-Good One, have you come for me? Receive me the poor one! I don't have anything!" This He desires. He desires nothing else." Elder Ephraim of Arizona: "Man’s life is a martyrdom..."
"Man’s life is a martyrdom. Ever since we fell from true happiness we gather the fruit of disobedience: “Thorns and thistles will the earth bring forth to you” (Gen. 3:18 ) –the earth of the heart will, too. How will we know that we are exiles, if not through afflictions and torments? There is no person who does not have something that afflicts him. Pious Christians are afflicted, too, but in the depths of their souls they also have the hope that one day the many afflictions will result in blessed repose for them. Without afflictions and sufferings let no one expect repose in the life beyond the grave. That life is for those who have labored and were heavy-laden by the weight of this present life. Of course, the saints had much grace and spiritual strength, and they rejoiced in suffering. But we, and I first of all, suffer and sometimes our patience breaks. But glory be to God, Who enlightens us to repent and correct ourselves. “The spirit indeed is willing, but the flesh is weak.” (Mt. 26:41 )." The entire world has found you to be a great champion when in grave perils; for many you have saved from losses: tracking the thieves‚ driving away deprivations and fulfilling the requests of those that run to you in faith; for these we pray to you‚ be merciful to us who sing to you: Rejoice‚ O Holy Martyr Menas the great passion bearer. Rejoice‚ ray of immaterial fire. Rejoice‚ the light of those at loss. Rejoice‚ the revealer of the kidnappers. Rejoice‚ the mystery that exposes the wicked deeds. Rejoice‚ the dam that stops the drifting. Rejoice‚ the pillar that hinders the rudeness. Rejoice‚ the depth that loses the gluttony. Rejoice‚ the breath that strengthens the hearts of those in suffering. Rejoice‚ the hand that discovers the lootings. Rejoice‚ the chain that bonds the lawless. Rejoice‚ the fog that clouds the unclean thoughts. 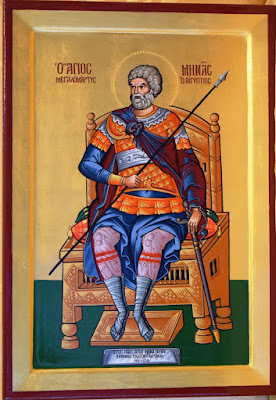 Rejoice‚ O Holy Martyr Menas the great passion bearer. A swift victor you were shown forth against the persecutors who wish to loot the work of the unfortunate poor and extinguish his being with menacing trials; for this we cry out to you: Rejoice‚ O Holy Martyr Menas the great passion bearer. Rejoice‚ the fall of the unlawful enemies. Rejoice‚ the tamer of the insatiable beasts. Rejoice‚ the moderation of the arrogant kidnappers. Rejoice‚ for those that disrespect your commandments tremble in fear. Rejoice‚ for those that do not seek your name as a helper are suffering. Rejoice‚ for those that do not glorify your wonders are lost. Rejoice‚ for those that distress you are troubled. Rejoice‚ for those that thank you boast of joy. Rejoice‚ for all creation rejoices of your mercy. Rejoice‚ for all that have trespassed repent in fear of you. Rejoice‚ the savior of those humiliated. Righteousness and peace having in your thoughts‚ you have left the war camp of Phrygia‚ being unable to watch the pagan worship; for this‚ going up the mountain‚ with fasting and prayers you cleansed your soul of sin and strengthened your faith in our Lord Jesus Christ‚ singing: Alleluia! The pagans‚ unable to bear your holy deeds that exposed their deceiving idol worship‚ for you were preaching the faith in Christ to the people and you were proving that He is God That performs wonders‚ not the stone and the brass of the idols‚ they put you through tribulations that you have lovingly accepted. Rejoice‚ the one that was whipped all over your body with leather thongs. Rejoice‚ the one that was burned with fire in the end. Rejoice‚ the one that endured the stinging of the iron thistles. Rejoice‚ for you were pierced all over with spears. Rejoice‚ for you have suffered iron mallets on your temple. Rejoice‚ for other works you have endured with patience. Rejoice‚ for you have not blamed God for your passions. Rejoice‚ especially for you have fought with joy against flesh and blood. Rejoice‚ for Alexandria was terrified by your strong faith. Rejoice‚ for the tyrants were reprimanded by your daring deeds. Rejoice‚ for not having anything else to scare you with‚ they commanded that you be slain by sword. The blessed faith of the East finally raising the Cross among the pagan nations‚after the fall of the tyrant monarchs enemies of Christianity‚ your church was built in Alexandria by a Christ loving citizen‚ in the time of Constantine the Emperor; and there your holy remains were brought so we can bow to them and sing: Alleluia! Rejoice‚ the founder of lost items. Rejoice‚ the one that brings them back in their original state. Rejoice‚ the boast of honest citizens. Rejoice‚ the happiness of the merchants with honest weights. Rejoice‚ the unsleeping watcher of villages and towns who suffer losses. Rejoice‚ the salvation of those threatened by flame or storm. Rejoice‚ the redeemer of the nations that trouble with terrible invasions and unrighteous oppressions. Rejoice the advisor of the travelers that ask your help. Rejoice‚ the savior of men from sudden death. Rejoice‚ the escape of the ships tormented by storms and thievery. Rejoice‚ the alleviation of the oppressed and plaintive soul. Rejoice‚ our own fast protector in sufferings. Food for the salvation of our lives send us from God‚ O Holy Martyr‚ so we do not perish from the multitude of the passions that pile up on us‚ for we are all sinners; but what sin or what multitude of trespasses can ever overcome the boundless mercy of God‚ having as intercessors the hosts of the martyrs singing with us: Alleluia! Rejoice‚ intercessor to God of those in pain. Rejoice‚ steadfast help in Him. Rejoice‚ powerful aid for those that keep His commandments. Rejoice‚ unashamed hope of Christians. Rejoice‚ incense well received in heavens through prayer. Rejoice chosen vessel of the Holy Trinity. Rejoice‚ the one that do not wish the wickedness of people. Rejoice‚ the one that cry for their lack of skills. Rejoice for you teach them to live in communion and love. Rejoice‚ for you always inspire them to good deeds. Rejoice‚ for you brought many to repentance. Rejoice‚ for you always pray for all. The Jew who was suffering because of the Christian who was hiding the money that he left in his care‚ wanted to be baptized seeing the miracle‚ as you uncovered the truth; and the Christian‚ trembling in fear of his wicked deed against his soul for his love of silver‚ repented crying to God: Alleluia! The oath breaker Christian and the shrewd friend of the Judean‚ as he was exiting your church where he has given false witnessing‚ that he does not know of that money‚ was kidnapped by the horse; and loosing on the way a ring and a key‚ you showed them to his wife at home‚ asking her to send to her husband the gold of the Jew‚ and as it happened immediately the trick was discovered. Rejoice‚ the revealer of the hidden trick. Rejoice‚ finder of the stolen gold. Rejoice‚ shaming of the wicked deeds. Rejoice‚ bitterness following their pursuit. Rejoice‚ fulfillment of the duties of faith. Rejoice‚ baptizer of the Judean. Rejoice‚ repentance of the lost Christian. Rejoice‚ glory of the Eastern Church. Rejoice‚ for through your miracle the power of the gift of grace was shown forth. Rejoice‚ for through the work of grace two souls were saved. Rejoice‚ worthy worshipper of Christ. How could we break the enchanted chains that the devil uses to bond the weak souls pulling them to him‚ if we would not have our thoughts meditating upon salvation? Therefore‚ strengthening our minds through the powers of the Holy Martyrs chosen by God‚ clear the fog of deception and loose the ties of the deceiver trough repentance‚ singing: Alleluia! Rejoice‚ Menas loved by God. Rejoice‚ giver of good gifts. Rejoice‚ worker of many wonders. Your name‚ more than any of the saints‚ is wished by the Christians‚ O Menas‚for they find in you the fast and full discovery of any loss they suffer. 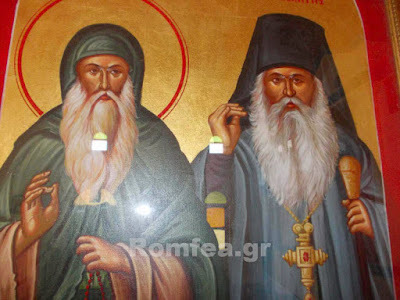 For this also suffering today they sit in front of your holy icon and with faith they pray to have mercy on them and fulfilling their need they can give glory to you singing: Allelluia! Rejoice‚ who have mercy on the poor. Let the passions you endured be a help toward our own passions and let the wounds of your body be a protection for the pains that trouble our rest. Give us therefore‚ in perils‚ your patience‚ O Holy Martyr‚ so through it we May achieve the salvation of our souls and strengthen our shortcomings‚ so we can sing: Alleluia! Rejoice‚ the embrace of those oppressed in judgments. Rejoice‚ victory of the soldiers that fight for the faith. Rejoice‚ fertile land of good deeds. Rejoice‚ beautiful flower from Syria. Rejoice‚ pearl chosen by God. Rejoice‚ rose with good fragrance among the thorns of idolatry. Rejoice‚ precious stone from the treasures of Egypt. Rejoice‚ gift through which the purpose of the Eastern Magi was fulfilled. Rejoice‚ cedar grown among the cedars of Lebanon. Rejoice‚ land irrigated by the Jordan waters. Rejoice‚ sleepless guardian of the monasteries of the Holy Mountain. Rejoice‚ faithful teacher of those who travel to the Holy Sepulcher of our Savior. The remains of the traveler killed by the wicked host to take his gold he was going to take to your church‚ cutting him in pieces and burying him in the garden‚ you unearthed‚ and‚ next day‚ making him again whole as he was‚ you gave him life. Terrified by this miracle the murderer fell down to your feet and with tears implored mercy. And the travelers awaken as from a dream after death gave glory to God singing: Alleluia! In vain was the attempt of the guilty host to hide the killing of the foreigner‚whom spending the night at his place‚ he hosted. And you‚ following him unseen for the love he had for you‚ you showed yourself the next day as a royal soldier‚ asking the host to give you the traveler‚ and him‚ lying about it‚ you discovered his acts and reprimanded him greatly. Rejoice‚ miracle above all miracles. Rejoice‚ for you were given the gift to restore and to resurrect the body slain into pieces. Rejoice‚ for the guilty one was terrified by your power. Rejoice‚ for the victim did not know why he was so terrified and hard on himself. Rejoice‚ for you did not want this miracle to be told immediately. Rejoice‚ for through your economy both were in great awe. Rejoice‚ the one that made the traveler fulfill his wish‚ worshiping you. Rejoice‚ for following on his promise he brought great gifts into your church. Rejoice‚ helper of all that run to you. Rejoice‚ helper of all that glorify you. Rejoice‚ provider of dowry to the poor girls. Rejoice‚ the one that lifts the burden of those in great debt. The Mystery of the providence that was fulfilled through you‚ Menas‚ being able to restore the body slain into pieces of the murdered traveler and to bring him back to life‚ is incomprehensible; for this‚ wondering of the gift that was given to you from God‚ in faith we sing: Alleluia! The self loving Eutropious‚ promising a vessel of silver for your church‚ and making two in the same time‚ thought that the one that had your name on it was more beautiful than his; so he decided to keep it for himself. But you disliking this wrongdoing took the vessel from his servant that was bathing in the ship and kept them both in the sea until Eutropious understood his greed and repented. Rejoice‚ for immediately you took out the servant with the vessel from the sea. Rejoice‚ for the servant unharmed shown forth to his master. Rejoice‚ for giving thanks to God‚ he took the vessel in the church. Rejoice‚ for you have reprimanded Eutropious for his daring act. Rejoice‚ the restorer of his greedy attitude. Rejoice‚ for you have saved the innocent servant from death. Rejoice‚ for in this way you wanted to show the power of true faith. Rejoice‚ for you brought glory to God through your miracle. Rejoice‚ for His name was glorified through your wonders. Rejoice‚ for in His name you suffered so you can partake in His victory. Rejoice‚ O Great Martyr ready to help. Sophia‚ a women from the land of Fecozalia that was coming to your church to pray‚ seeing her self in danger of being abused by a soldier‚ asked you for help with voice‚ and immediately you saved her‚ exposing him with shame to the others; for this the women gave glory to God singing: Alleluia! The paralytic and a dumb women‚ that were sitting near your church with other sick people‚ waiting for their healing‚ saw you in the middle of the night‚saying: “You‚ the paralytic‚ wake that lady and flee from here”; at what words‚the paralytic‚ for he thought he was being sent away from you‚ was not moving; but you‚ asking him again‚ he had to listen and immediately they realized they were cured. Rejoice‚ for the paralytic ran away terrified. Rejoice‚ for the frightened dumb women spoke. Rejoice for you have cured other sick also. Rejoice‚ for you humiliated the unfaithful. Rejoice‚ for you gave joy to the lovers of Christ. Rejoice‚ for you sheltered the foreigners. Rejoice‚ for you fed the hungry. Rejoice‚ for you had mercy on the widows. Rejoice‚ the protector from perils. Rejoice‚ the savior of Sophia. Rejoice‚ the comforter of the oppressed. 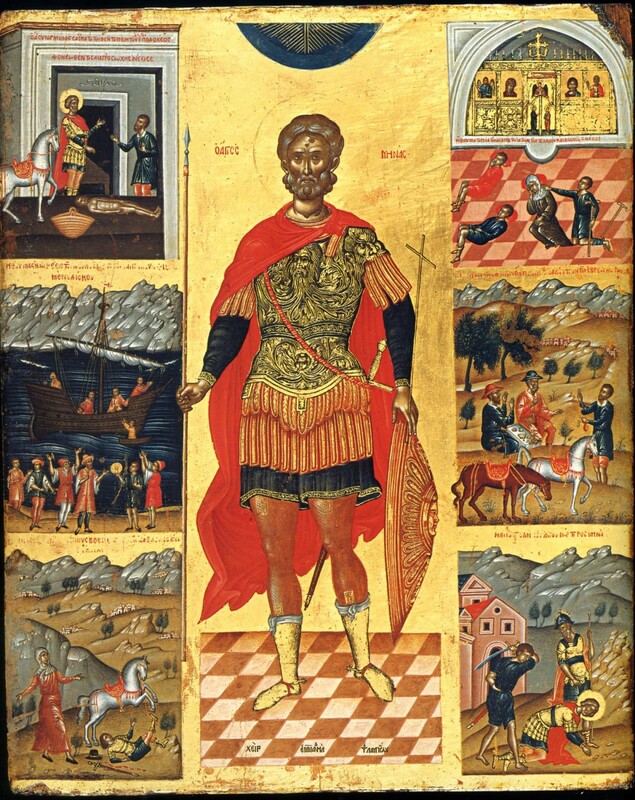 O‚ all blessed Martyr Menas‚ listen to the voice of our prayer that we bring to you with all our heart‚ save us from all diseases and dangers so we can praise your commemoration and become witnesses of the miracles that‚ with the power of the gift of the Holy Spirit‚ you work for those who sing in faith to you: Alleluia! Prayer to the Holy Great Martyr and Wonderworker Menas of Egypt. 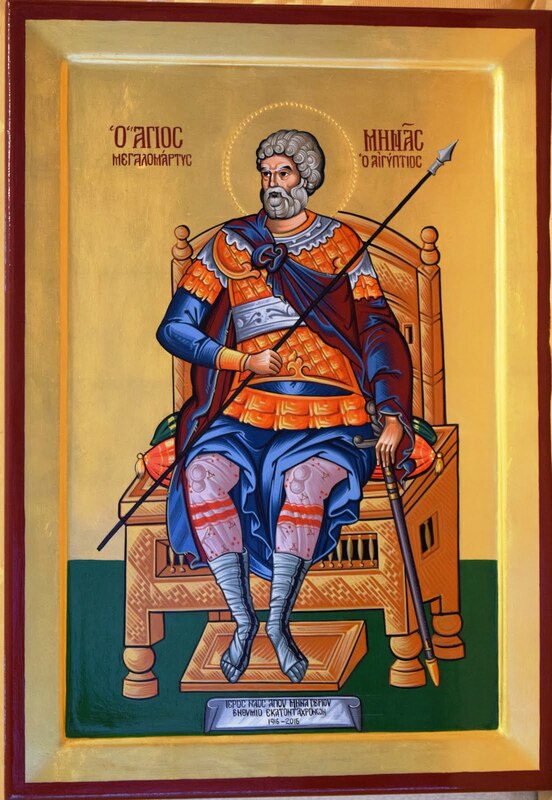 O‚ Most Holy and all-lauded Great Martyr and wonder-worker Menas; receive this prayer from me‚ your unworthy servant‚ because to you‚ as a true fountain of healings‚ ready to help and miraculous helper‚ I come with tears of repentance to your holy icon and pray: See my loss‚ O Holy Martyr‚ my insufficiency and my wickedness‚ see the wounds and the plague of my soul. Therefore I pray to you‚ blessed and Holy Menas‚ hasten to help me with your holy prayers and sustain me your servant. Take heed to my sorrows and do not overlook me the sinner‚ for I know‚ O Holy Martyr of God that you endured dreadful and terrifying tortures from the lawless ones for the love of Christ‚ but through these sufferings you live enlightened today and you found the gift from God. We are certain that even after your divine passing from this ephemeral life‚ all the ones that asked your help with faith in your church were not deceived and continued to receive your help. For who called you for help and you did not hear? Or who called you‚ O wonder-worker‚ and you overlooked? Or who‚ being at loss and running to your help‚ you did not recovered his deficit? Your miracles and your help compelled me also‚ the wicked and the sinner‚ to run to your help. I heard of the merchant from the land of Isauria that was coming to your church to pray and not only had you revealed his murderer‚ but you also recovered his loss giving him back the purse with gold; but O‚ great wonder‚ even the dead man‚ cut into pieces‚ you healed and made healthy. In the same manner you took out of the water the servant of Eutropious with the golden vessel he was holding in his hands‚ because he had promised it to your church. Also the women Sophia‚ that was coming to worship in your temple‚ not only you saved her from the soldier that was forcing her into sin‚but you also reprimanded him according to his deeds. In the same manner the paralytic who was coming to your church you healed immediately. And the dumb woman started speaking and she spoke clearly. So the Judean that gave his Christian friend a sum of money and the Christian denied to have received it‚ taking an oath into your very church‚ you not only saved the Christian from his lying oath‚ but even the Jew‚ seeing the miracle‚ believed in you and became a Christian. These miracles of yours‚ O Holy Martyr‚ make me believe that you are ready for every good deed and you are ready as a quick and miraculous helper. Therefore I am convinced that everyone that runs to you‚ asking your help with faith‚ you do not overlook. I also believe that you are the same‚ O Holy Martyr‚yesterday and today‚ and that all that run to you do not return without help. 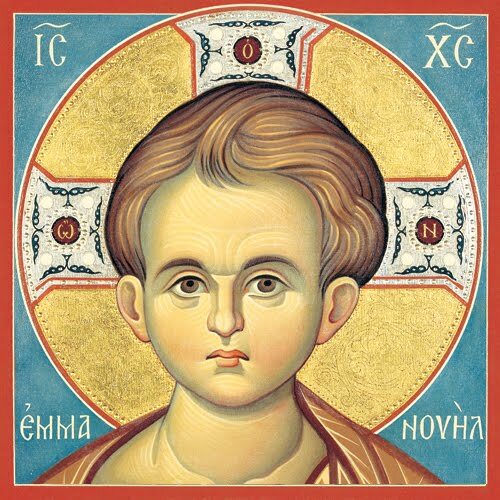 For this I also today‚ being at loss and in distress‚ I run to you in faith and‚ with tears‚ kneeling down‚ I pray to you‚ O Holy and Great Martyr Menas‚ intercede for me‚ the one at loss and in distress‚ to Christ‚ the Son of God that have not overlooked your martyr prayer‚ but listened to you‚ gave you strength and received you in the holy abodes. Pray to Him so I May receive help and mercy through your prayers‚ and I can be saved from my losses and my tribulations‚so I can glorify and bless the all holy name of the Father and the Son and the Holy Spirit‚ now and forever and unto the ages of ages. Amen.